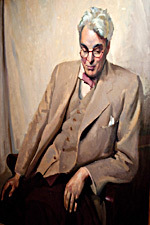 WB Yeats (1865-1939) was a dramatist, the writer of shimmering, sculpted prose, a magazine publisher, a dandy, a magical initiate, the enemy of Aleister Crowley, a politician, a champion of Irish independence in the decades before the proclamation of the Republic, and a pioneer ahead of his times. But most of all he was Ireland's great arch-poet, her national poet, and his work is rightly considered among the finest of 19th and 20th century literature. Yeats looms almost as large in Irish culture as Shakespeare does in British, and like Shakespeare his expressions have found their way into common parlance. Phrases such as no country for old men; a terrible beauty is born; the centre cannot hold; peace comes dropping slow; all is changed, changed utterly; tread softly for you tread on my dreams and what rough beast, its hour come round at last, slouches towards Bethlehem to be born? have become of the common linguistic heritage of Ireland, Britain and beyond. Many of Yeats' poems, including The Song Of Wandering Aengus, The Stolen Child and The Lake Isle Of Innisfree, are among the most popular in the English language. He wrote in a unique voice, rich in evocations of the classics and old mythologies yet capable of lightness and deftness, with a contemporary edge that has lost none of its sharpness today. He expressed vulnerability, longing, humour, power, rage, disdain and wonder with equal passion and clarity, and explored his subject set � love, politics, metaphysics, Ireland and the strange adventure of being a human on planet earth � from a deep well of soul. He published around five hundred poems, numerous of which lend themselves to musical treatment. A recent trawl of iTunes revealed 300 currently-available adaptations of Yeats by artists famous and obscure, and certain of his lyrics have been set to music twenty or thirty times. The most frequent is The Cloths Of Heaven, with its famous "tread softly" refrain, the subject of almost forty musical renderings mostly by classical or lieder composers of the early twentieth century. In recent years The Song Of Wandering Aengus, with over twenty adaptations, has been sung by Judy Collins, Ritchie Havens, Dave Van Ronk, Donovan, Terry Callier, Christy Moore, David Gray and many others. And since the 1970s Yeats' words have been sung by Van Morrison, The Fugs, Shane MacGowan, Joni Mitchell, Bono, Loreena McKennit, The Cranberries, World Party and a host of less well-known artists. The Waterboys' Yeatsian work began in 1986 when the lyric of The Four Ages Of Man found its way into live performances of the song Spirit. Two years later we adapted Yeats' faery poem The Stolen Child for their Fisherman's Blues album. Since then, with some help from my colleagues, I've crafted a collection of around thirty-six arrangements, twenty of which go together to make An Appointment With Mr Yeats. This album is a distillation of that work. We hope you love it.